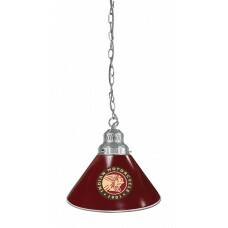 Deck out any space in your garage, man cave or living room with extra lighting with an Indian Motorcycle Pendant Light with a burgundy or white shade. Available in three metal finishes and made by Holland Bar Stool Co. Add light to your room with a true classic that is true to the game. 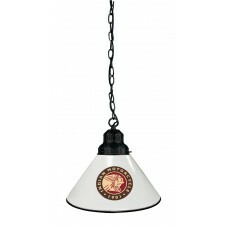 This Pendant Light by Holland Bar Stool is a must have for your man cave. Whether above your pool table, game table, pub table, or bar, this game room classic is sure to impress. 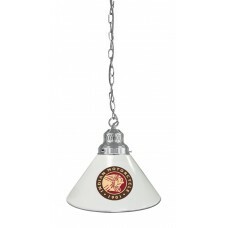 The light hangs from a canopy and comes with 4’ of chain. 5' power cord has a 3 prong, polarized plug. Light fixtures are vented to allow heat to escape instead of building around the socket, prolonging bulb life. Edge trim on the polypropylene shade matches the fixture. Lights are UL approved. Product is assembled in Holland, MI.